Wimberley, Texas consists of a small, quaint community southwest of Austin. It has an abundance of charm and rural character. Wimberley real estate includes numerous opportunities in not only homes for sale but for prime Texas land for sale. Plenty of homes with acreage, ranches and recreational land can be found. A beautiful Texas Hill Country backdrop sets the stage for living in Wimberley. The crystal-clear Blanco River runs beside the village. 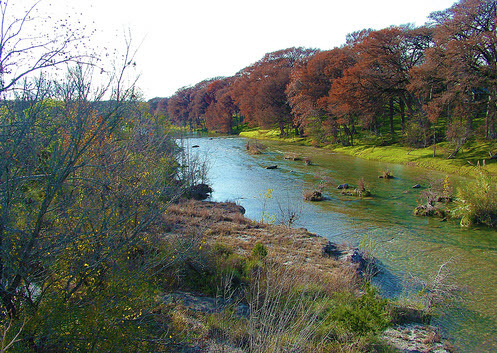 The Cypress Creek meanders through Woodcreek and Wimberley. It begins upstream at Jacob’s Well, a large artesian spring. This is an ecological resource with ample vegetation and wildlife over 81.5 acres. Wimberley homes for sale offer an abundance of quality craftsmanship, desirability and price appeal. They offer a unique experience in rural living with an accent on modern amenities. People looking for that ideal country home, whatever the age group or family size, are sure to find something to suit their tastes in Wimberley real estate. There are various neighborhoods, each with their own unique character. Paradise Hills, Skyline Ranch Estates and River Mountain Ranch feature hilltop views, while River Oaks, River Mountain and Southriver offer riverfront homes on Blanco River. There is also Rancho Grande and Village of Wimberley. Dappled with tall trees, surrounded by rolling hills, a popular choice for home buyers and Texas land buyers alike is Wimberley. Beautifully spread out neighborhoods offer plenty of room to roam. There’s ample acreage, green spaces, equestrian facilities and more. With all the fun things to do in Wimberley, families will love living in the area. There are plenty of rivers to go floating and swimming. Residents can also go hiking. In addition, the Quicksand Golf Course features an excellent round of golf with obstacles for all skills sets. Entertainment is plentiful near Wimberley real estate. For live music, places such as Susannas’s Kitchen or Wimberley Square are great. There is also Cypress Creek Cafe’s Buzzard Lounge and Inoz for entertainment. Corral Theater and Shakespeare Theater are both places to catch a play. The community is home to great schools. Wimberley real estate is served by the public schools in Wimberley Independent School District. There is one primary school, one elementary schools, one junior high and one high school. It’s a small town so students grow up together. The schools are Scudder Primary School, Jacob’s Well Elementary, Danforth Junior High and Wimberley High. Living in Wimberley real estate means having access to events and celebrations. The town puts on seasonal and holiday festivities great for the whole family. These include Wimberley Market Days, Butterfly Days, Gospel Fest, Jazz Fest and the Wimberley Pie Social. Texas Hill Country living doesn’t get much better than Wimberley. If you would like more information on the homes for sale in Wimberley, contact the real estate professionals of McNabb & Company for a simple and smooth process. Find Wimberley Real Estate, Including Homes for Sale and Lifestyle Info. STUNNING HILLTOP CUSTOM 4/3.5/3 HOME with 3,767 sqft. Private and perfectly situated on 5.48 acres, you will find this property is exceptional. Situated perfectly on the hill side, the open living, dining and kitchen area as well as the covered patio have stunning views overlooking the hill country. There are custom built in cabinets throughout the home. Master bath is a relaxing hideaway with a jetted tub that overlooks the hill country which is also equipped with a fireplace to add to your luxury living. Majestic & Awe-Inspiring - you must see this one. VIEWS! VIEWS! VIEWS! STUNNING CUSTOM HILL COUNTRY HOME HIGH ON BLUFF OVERLOOKING 15+ ACRES WITH WILDLIFE EVALUATION! MOVE-IN READY! OPEN CONCEPT LIVING OFFERS HIGH CEILINGS, WOOD-BURNING FIREPLACE & CONCRETE STAMPED AND SCORED FLOORS THROUGHOUT! 2 OFFICES! FLEX/EXERCISE ROOM! DEEP FRONT PORCH OFFERS PRIVACY AND GORGEOUS VIEWS! GREAT FOR ENTERTAINING! 20 X 20 STORAGE BLDG.ROOF REPLACED JAN 2019 STANDING SEAM. 3RD BEDROOM/EXERCISE HAS NO CLOSET. Asphalt driveway takes you through automatic gate to the house and beautifully landscaped front and back yards with great views. There are rock flower beds, rock walkways and numerous beautiful oak trees. It has a small orchard with peach, plum and assorted fruit trees. House and 1.5 acres are high fenced . Also on the property is a barn/workshop, covered RV area, a small pole barn and nice chicken coop with run. Great 4/3/3 w/a pool in River Mountain Ranch. Nestled among the oaks home features hardwood floors, cooks kitchen w/island, gas cooktop, granite counters & open to family room. Master & 2nd bedroom down w/2 bedrooms & gameroom up (used as her office). Owner using 4th bedroom as his office, but connected to full bath. Outdoor features include pool with waterfall & spa; patio & firepit, & builtin BBQ. Plenty of parking in 3 car garage with automatic gate entrance to motor court. Private River Park Home also features circle drive way. Take a walk thru the woods on private walking path or head down to the Blanco River park. Custom Hill Country Home on 6.485 tree filled acres. This home features formal living and dining rooms, spacious family room with fireplace. Gourmet kitchen with breakfast area, center island, double oven, walk in pantry, ample cabinets and granite counters. Split floor plan with 5 bedrooms, 3 on one side and with full bath. Master bedroom and guest bedroom on the other with their own baths. Covered patio and a large deck off the back, storage room off the garage. Beautiful piece of property very private. Blanco river access. Relax on your own piece of Wimberley's Heaven. This fabulous light log home, with an attached guesthouse, sits on a deep and serene part of Loneman Creek. Sit on the private balcony and enjoy the sounds of the waterfalls and the diverse bird habitat. The main home is an open concept with soaring cathedral, beamed ceilings, huge windows and hardwood floors. The charming guest house, 1100 Sq ft log cabin, has its own kitchen, bath with claw foot tub, and deck overlooking the creek. Relax, your home. Fall in love with this stunning property in Rainbow Ranch! Situated on 10 beautifully wooded acres, this 2,386 square foot 5 bedroom 2.5 bath home offers all of the peach and privacy you desire. With an open floor plan, vaulted ceilings, multiple dining areas, bonus room and a fireplace, this home has it all! Detached utility/workshop in the backyard could be used in so many different ways. Fantastic Hill Country location convenient to Wimberley Square, San Marcos, Dripping Springs & Austin. Rare find on the Blanco River with bluff views in this rock home, saltillo tile floors throughout, rock fireplace, chefs kitchen with stainless steel appliances, granite countertops throughout, built-ins, and a gameroom. Large master with a master bath that has a walk-in shower. Nice patio set up and ready for BBQ's. Home was built with steel frame and completely remodeled. Also has a deck across the back of home and stairs down to the river. Come enjoy the River with easy access to play in the river and float down. Gotta see this one. UNRESTRICTED! LOVELY 4/2.5 MAIN HOUSE AND CHARMING 2/1 CASITA SITTING ON 5 BEAUTIFUL ACRES! Unique opportunity for primary, secondary or income producing property. Located minutes from downtown Wimberley and all the whimsey that cypress creek has to offer. Quiet and set back from the road where you can enjoy an early morning cup or evening star gazing at its finest. If you are looking for that secluded piece of Texas Hill Country, this is your place. Pristine, a bit rugged, plenty of views, woods, wildlife and for the most part same size or larger acreage surround you. The Mfg. home is just perfect for those weekend get-aways or a place to park while building your home. Good fencing on three sides. Native pasture land, wooded with native oaks, cedars and other native trees. Hills, sloping and gently rolling, slightly rocky. Four wheel drive trails go all around the place, two wheel to an extent. Fun Place! Charming Victorian farmhouse on 2 hillside acres in Wimberley. Just across the street, you will enjoy access to Lone Man Creek via the community water park. This custom home offers character inside and out with the oversized porch, handcrafted crown molding, aromatic cedar floors, and new marble countertops. Massive master suite on the main level. Bonus room plus 3 bedrooms upstairs. The wooded, corner lot offers privacy, with close proximity to Wimberley or Kyle.